While kittens are undeniably adorable, there are many perks to taking home an adult cat that you may not have thought of. For one, adult cats can save you a substantial amount of money, as most have already been spayed and received vaccination shots. 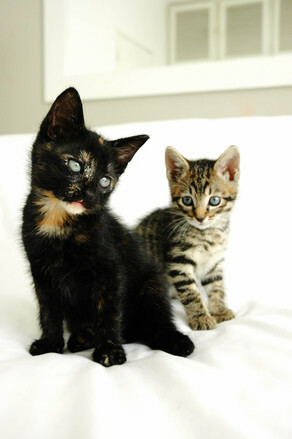 What’s more, most adult cats have been litter-box trained, and can adapt more quickly to a new home than kittens. Adopting a grown up cat will save you from having to kitty-proof your house. In general, if you don’t have that much time to dedicate to supervising and training a kitten then an adult cat would be a great match for you. You can also narrow down the age of your future adult cat based on your lifestyle and family composition. Younger adult cats are perfect for a home with small children, or for those who work outside of the home and need to leave their cat unattended for hours at a time. Conversely, a more senior cat would we great for a family with adolescents and can act as a great playmate for other adult cats that may have lost a feline companion. In general, adult cats get along best with other adults cats, compared to kittens. While kittens often trump adult cats on cuteness, there are a lot of aspects to consider before committing to bringing an untrained animal into your house. In general, kittens require a lot of supervision and training. They will need to be taught what they can and can’t play with and where they should eliminate. Also, keep in mind that a kitten will need to be neutered and receive proper vaccinations to maintain her health. The Blue Cross for Pets recommends only taking home a kitten (who is at least 8 weeks old) if someone is able to stay at home for a substantial part of the day to give your cat the care and attention it needs. If you have small children in your house, it’s better to consider adopting an adult cat, as the combination of an untrained kitten and a curious toddler may result in lots of scratches. It’s also important to remember that a cat’s lifespans can be very long, up to 20 years. If you adopt a kitten, keep in mind that it is a long-term commitment. Lastly, it’s very important that you have your potential new kitten screened by a vet for common feline illnesses and that you choose the right breed for your lifestyle. Regardless of age, it’s also important to chose a cat breed that matches your lifestyle and interests. If, for example, you are a high-energy person and are seeking an equally energized cat to play with, the following cat breeds are a good match for you: Abyssinians, Japanese Bobtails, Balinese and the Sphynx. These breeds all require playtime and love to keep their owners’ attention. Active cats also tend to be more vocal, which is something to consider when choosing the right cat for you. While not all cats are aloof, they have a reputation for enjoying solitude. If you are looking for a cat that won’t mind if you work long hours outside of the house, these breeds may be a good match for you: British Shorthair, Russian Blue and American Shorthair, Ragdoll, and Scottish Fold. If you enjoying brushing your cat and don’t mind shedding, these cats are great: Siamese, Himalayan, Munchkin, Burmese, Ragdoll, and Persian. Lastly, if you want to cuddle constantly with your cat, you’ll want to look within this list for the most affectionate cat breeds: Chantilly, Siamese, Ragdoll, Sphyx, Persian, Tonkinese, Cornish and Devon Rex.